Dice Forge combines the two things I love about board games: customization and cool bits. The game uses both of these so well I’m almost ready to forgive its rather basic mechanics. The game itself is, at its heart, a sort of hybrid dice-roller/deck builder, but with the twist that your dice are your deck. Each turn, every player rolls two big clunky dice and adds whatever resource they’ve rolled into their stock. 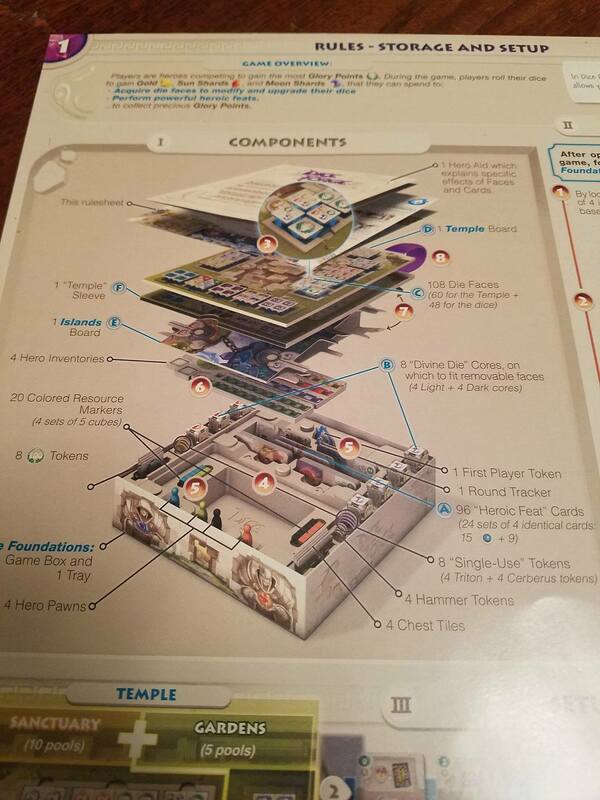 Gold is, at least in the early game, where the real fun of the game lies – you spend Gold at the “Temple”, which lets you claim new die faces. You take these and affix them to your current die, replacing one of the faces. There are three basic resources: sun shards, moon shards, and gold. Gold is, at least early in the game, where the real fun lies: you can spend gold at the “Temple,” which lets you claim new die faces. You take these newly purchased (plastic) dice faces and easily “click” them into your current die after removing one of the other faces. The new dice faces have higher values of the three resources or will allow you to choose between two or more resources. 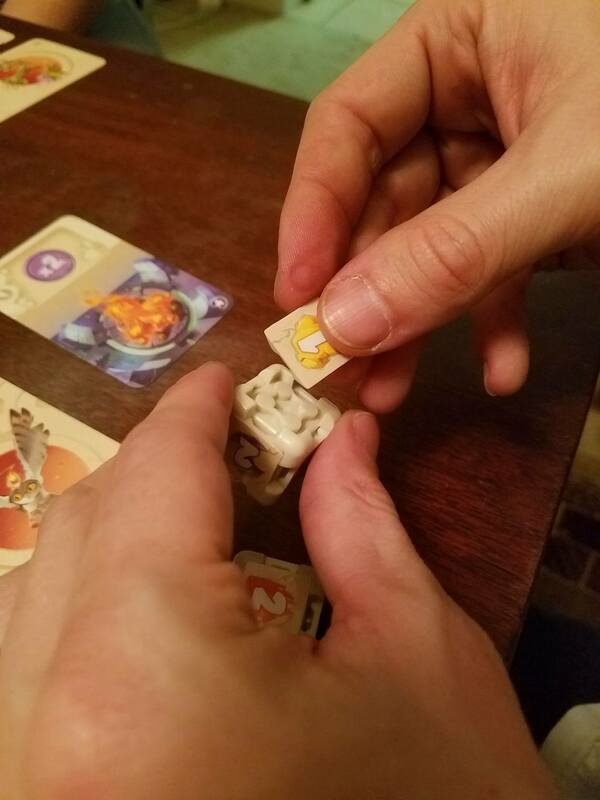 This, in turn, allows you to roll more sun shards or moon shards, which you can then use to go on “quests.” Quests involve claiming cards which grant you special abilities, special dice faces, or, most importantly, victory points, which are ultimately how the game is won. Mechanics aside, let’s talk about how this actually feels! I liked Dice Forge probably more than it deserves. It’s a simple game with very little player choice beyond which cards to claim first, especially with almost everyone already aware of which ones are the best ones by your second game. This becomes a problem the game tries to alleviate (with some success) by having a fairly large pool of cards to set up with. Unfortunately, given the fairly minimal amount of options you have, it doesn’t take long to figure out an optimal strategy. Then it’s just a luck-race to the finish line. That said, it’s still a pretty fun race! And yes, I know some of my board game comrades will cringe at the usage of the word ‘fun’ here. The mechanic of customizing your dice feels excellent and is helped by the tactile, solid components and immaculate board space design. The limited choices can be restricting and often frustrating, but also makes every turn a potential player-screw that can significantly ramp up the stakes. The wide variety of dice faces and special card combos also mean that even if you know the “best” tactics, it’s still an absurd joy just to play around within the game space. You figure out little tricks you can pull with some of the faces and anticipate your next turn until you can finally grab that last remaining face and turn your dice into monsters. 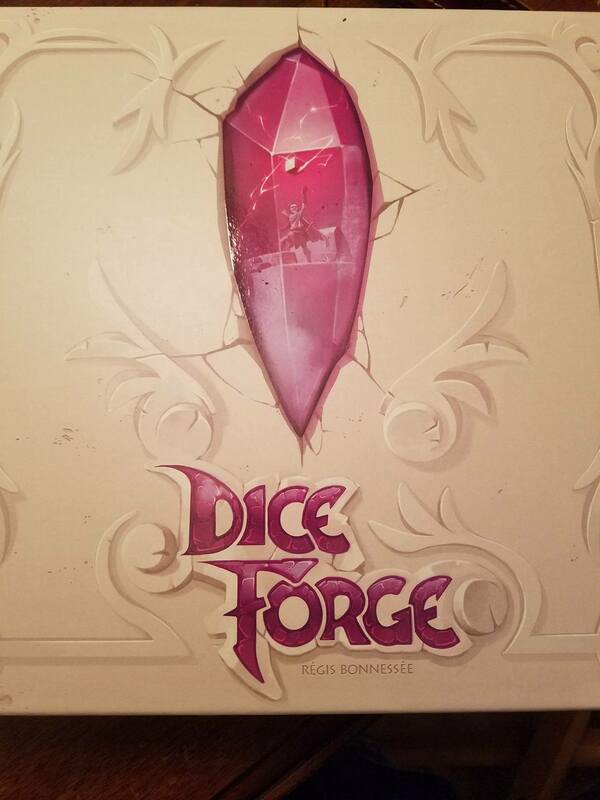 It’s obvious that a great deal of love went into Dice Forge. The way that even the box is put together just screams that the game is the glorious, end manifestation of someone’s beloved pet project. That sort of true commitment clearly penetrates into every corner of the game. The art is honestly charming as all hell, with player boards that are stunningly elaborate beyond what they needed to be. And the dice… oh, the dice are things of wonder. their dream game here, and it shows. It’s not hard to recommend Dice Forge. 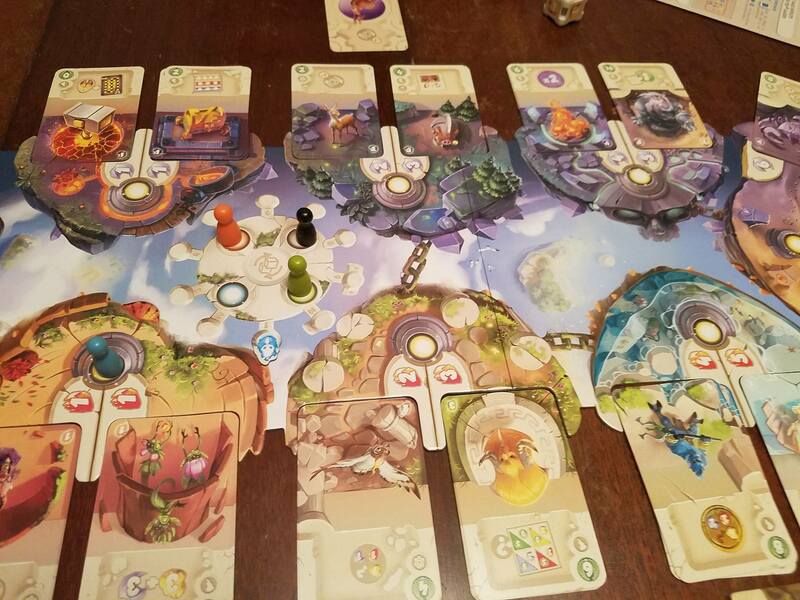 At its core, it remains a basic game, true, but every element makes it an engaging delight. When you first set up and look over all of the options, dice faces, and cards laid before you, it’s impossible not to let your mind run wild with the possibilities. 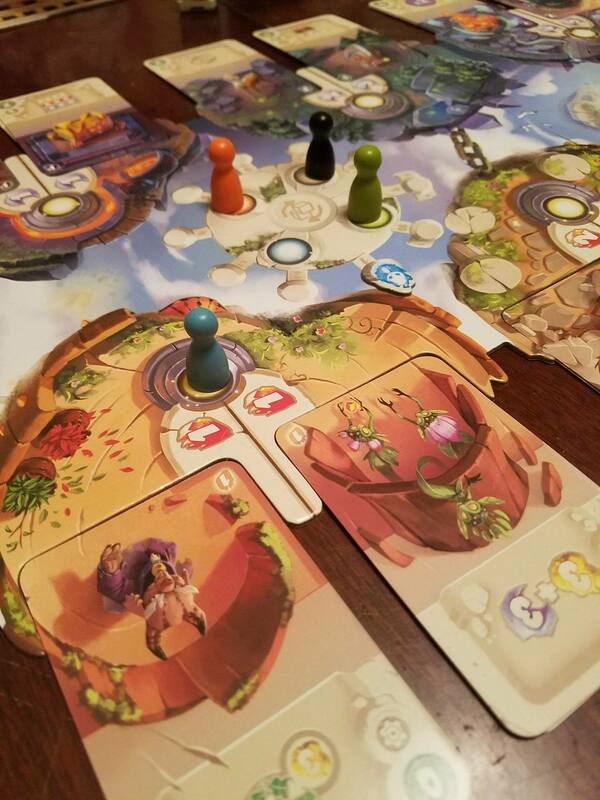 While that initial dazzling spell may fade after a few games, you’re still left with a fast, elegant game that’s full of beauty. The dice faces and cards are, yes, ultimately predictable, but still unique and appealing. Each of these components adds a boost or turn on the core “Roll Big Dice” mechanic. As a parting word, this is one of the most “One More Game!” games I’ve played in a long time. Every single time this hits the table, I know for a fact we’ll be playing two or three times at least. Each game is just fast enough that it’s not a slog, is random enough that you want just one more roll, and is dynamic enough that you think you can do better every single time.